Whether at home or at work, I rely on Gimp a lot for my image processing needs. Out of the box, Gimp has a lot of powerful features but, as it is an extensible software, people can add plugins to it to make it more powerful. Yesterday, I came across two excellent Gimp plugins, Liquid Rescale and Resynthesizer, which I would like to share with you. Liquid Rescale: this open-source plugin resizes pictures non uniformly while preserving their features, i.e. avoiding distortion of the important parts. In the example above, the picture has been enlarged while the lady has been preserved. I’ve spent some time with the plugin last night resizing some of my pictures in both the x- and y- directions and the results are impressive. Resynthesizer: this other open-source plugin restore missing parts in an image. In the example above, the image was rotated and, consequently, some parts were missing (the lower left portion for instance). 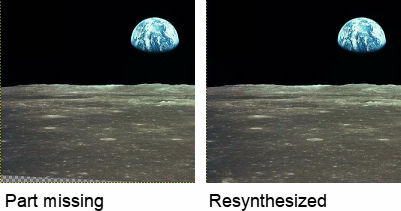 Resynthesizer can create the missing part from surrounding pixels very quickly. I’ve done some tests last night and the generated portion seamlessly flows into the existing part. Here is an excellent tutorial. I suppose Debian and its derivatives should have the plugin too. As any open-source software, installation from source is also a possibility.